Been wondering what’s going on at the corner of Kingston Pike and Northshore Drive in Bearden? Crews have been working the last couple of weeks to demolish the former Simoniz Car Wash, which has been out of commission since fall 2013. 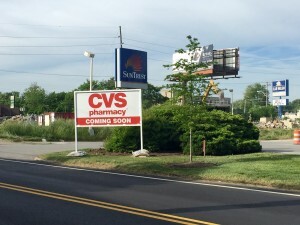 It now appears the high-profile lot adjacent to Food City will now be home to a CVS Pharmacy. It is scheduled to open in November. An existing CVS is located just a half mile east of the new site. CVS spokesman Mike DeAngelis said the nearby store will transfer operations, and all employees will relocate to the new store. This entry was posted in commercial real estate, retail on May 14, 2015 by carlyharrington.